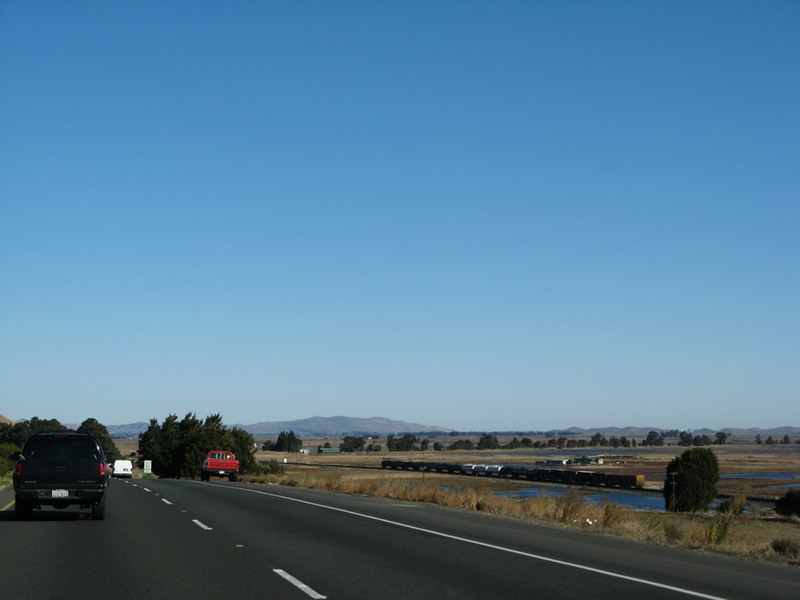 Interstate 680 leaves Contra Costa County and enters Solano County midway across the George Miller III Benicia-Martinez Bridge. 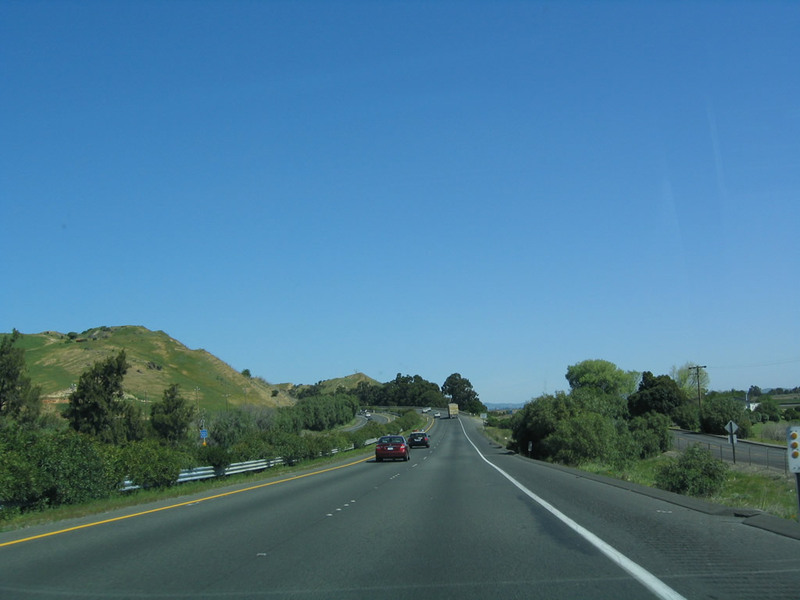 At the same time, Interstate 680 enters the city of Benicia, which is home to 26,865 people as of the 2000 Census and was founded on May 19, 1847. The city briefly served as the capital of the state of California, from February 11, 1853 through February 25, 1854 until the capital was permanently moved to Sacramento. [NOTE: To see the old configuration of the bridge and the Interstate 680/780 interchange, see the bottom of the page.] Photo taken 11/23/07. 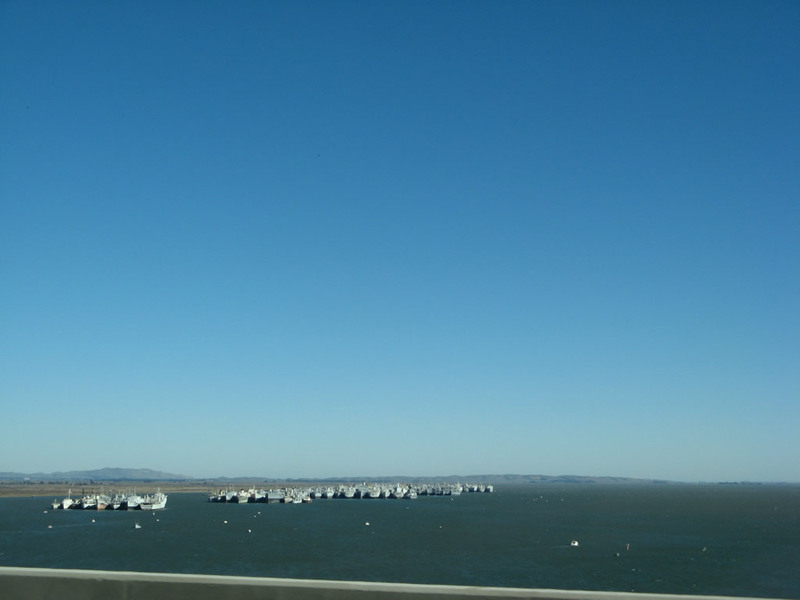 Looking east from the northbound lanes of the Benicia-Martinez Bridge is this view of several decommissioned ships in the Carquinez Strait/California Delta of the Sacramento and San Joaquin Rivers. Photo taken 11/23/07. The left two lanes of Interstate 680 north become exit only for Interstate 780 west via Exit 58A. Through traffic for Interstate 680 north to Fairfield and Sacramento should stay in the right three lanes. Note the changes in the pavement markings to reflect the left two lanes becoming exit only. Photos taken 07/05/13 and 11/23/07. 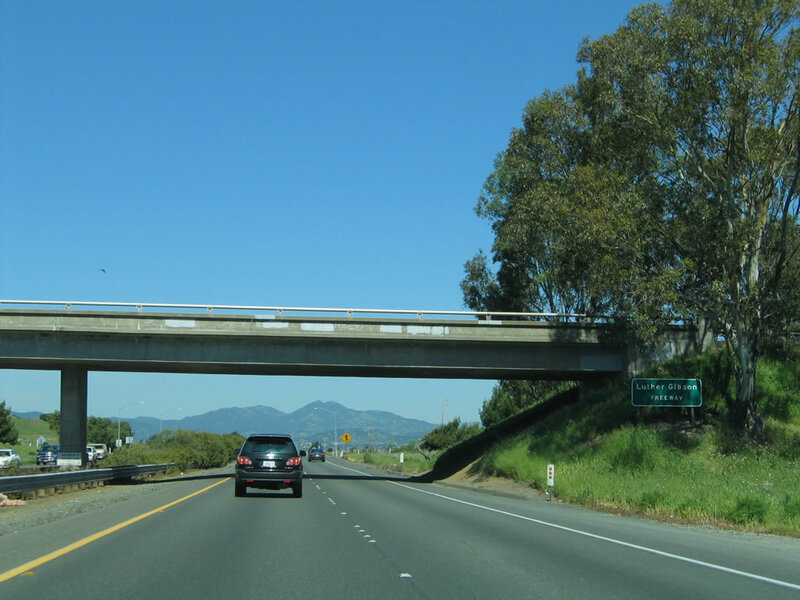 Due to the construction of the new northbound bridge, the interchange with Interstate 780 has seen several changes, including the new flyover ramp that connects eastbound Interstate 780 with northbound Interstate 680. This ramp can be seen passing from left to right on the shore. 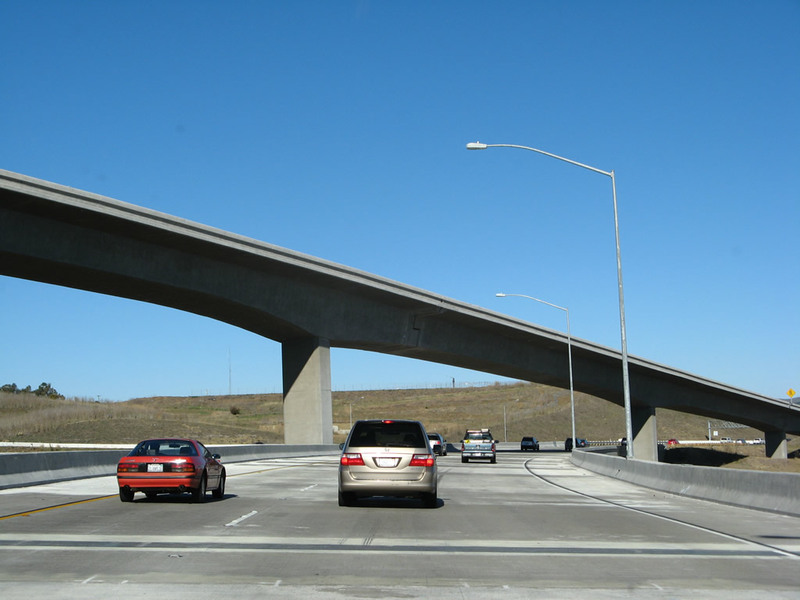 This ramp forms the top level of a three-level stack, which also includes the connection of Interstate 680 north to Interstate 780 west on the second level and the southbound lanes of Interstate 680 on the bottom level. Photo taken 11/23/07. 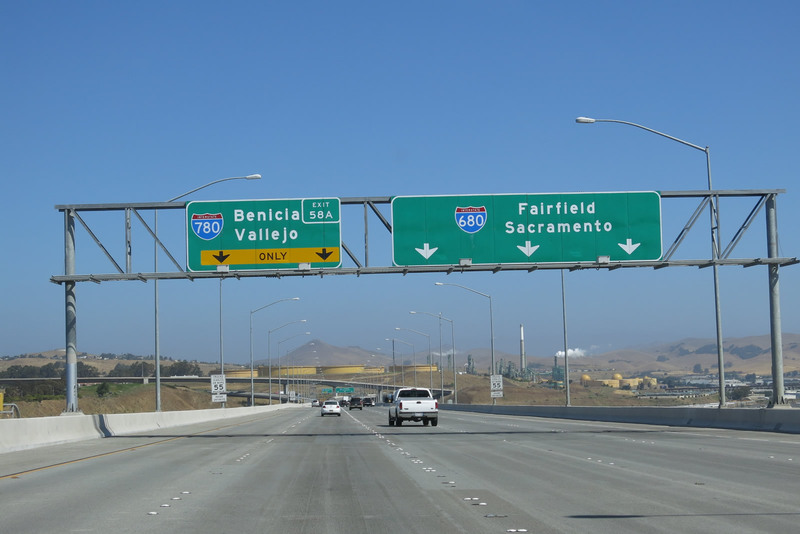 Northbound Interstate 680 reaches Exit 58A, Interstate 780 west to Benicia and Vallejo. 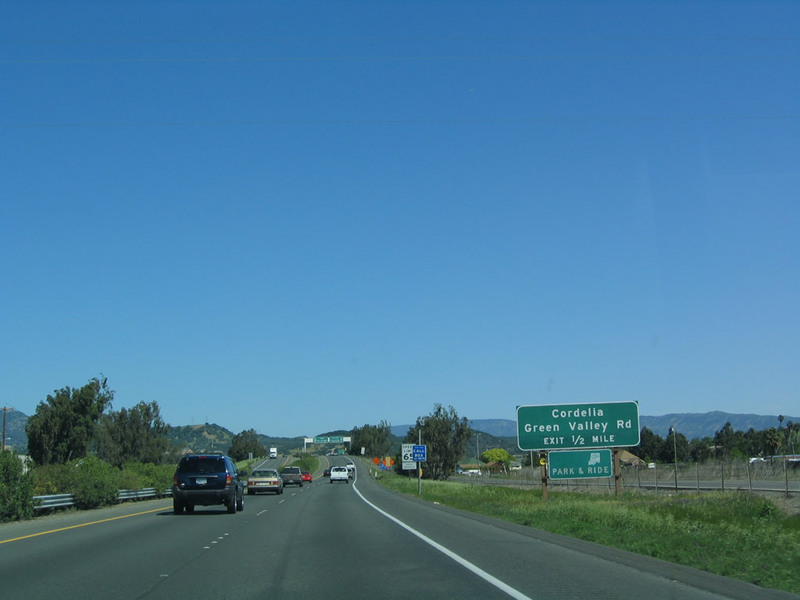 Use Interstate 780 west to Interstate 80 east to California 37 west to effectively bypass Vallejo en route to Napa Valley and points north on California 29 (including Calistoga, Middletown, Clearlake, and Lakeport). 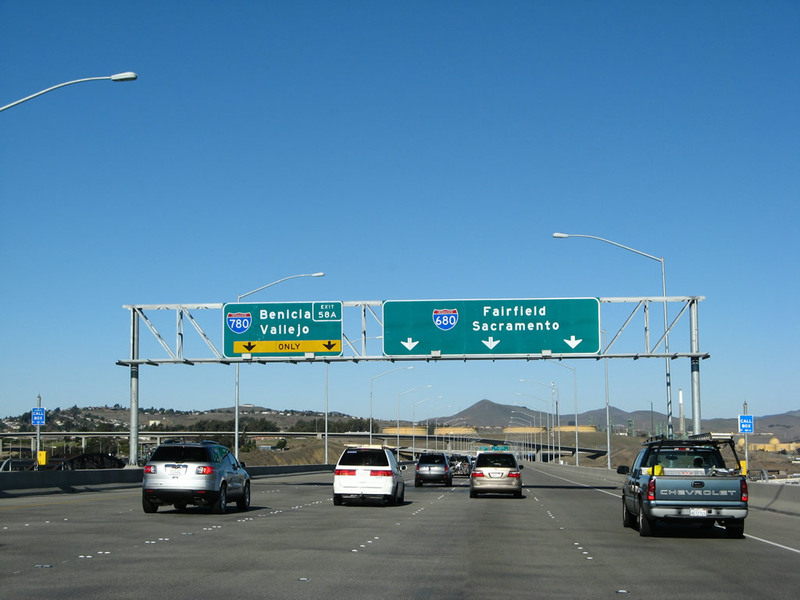 The right three lanes continue north on Interstate 680 to Fairfield, where the freeway ends at Interstate 80. 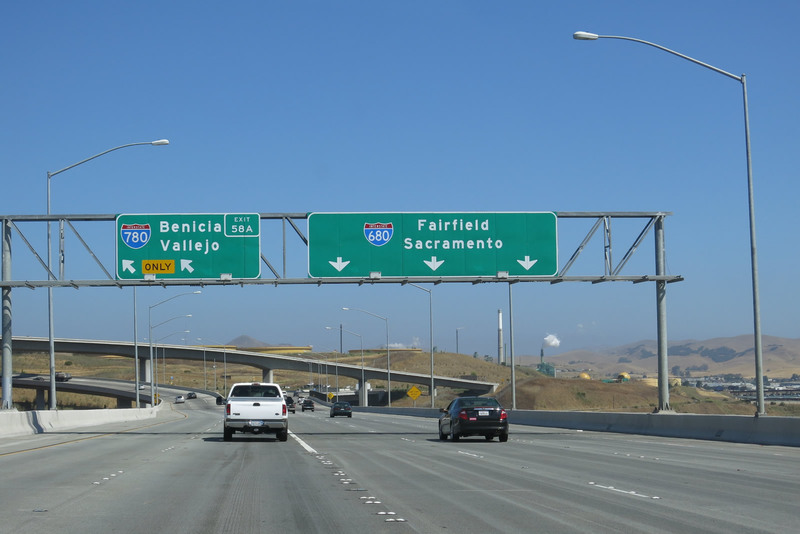 From that point, Interstate 80 continues northeast to downtown Fairfield, Vacaville, Davis, Sacramento, and points east via either Interstate 80 or U.S. 50. Photos taken 07/05/13 and 11/23/07. 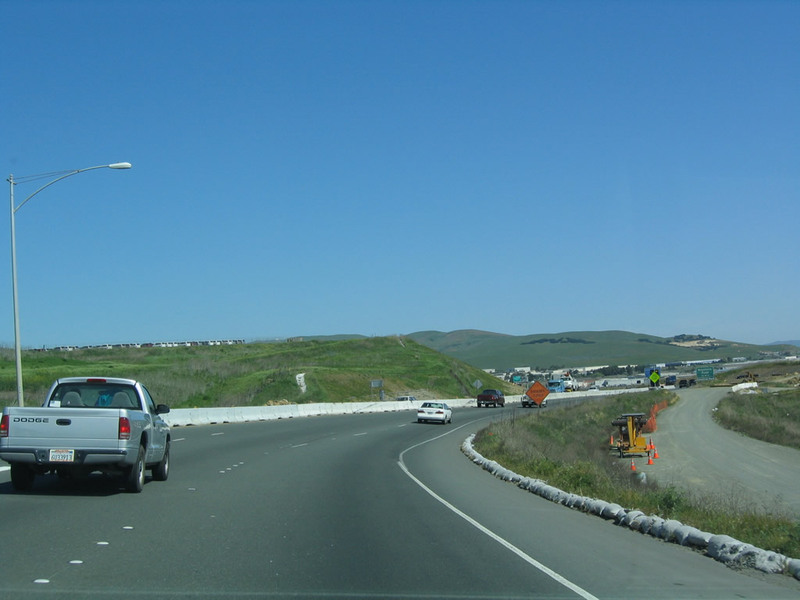 Two lanes carry traffic from Interstate 680 north to Interstate 780 west on this transition ramp. 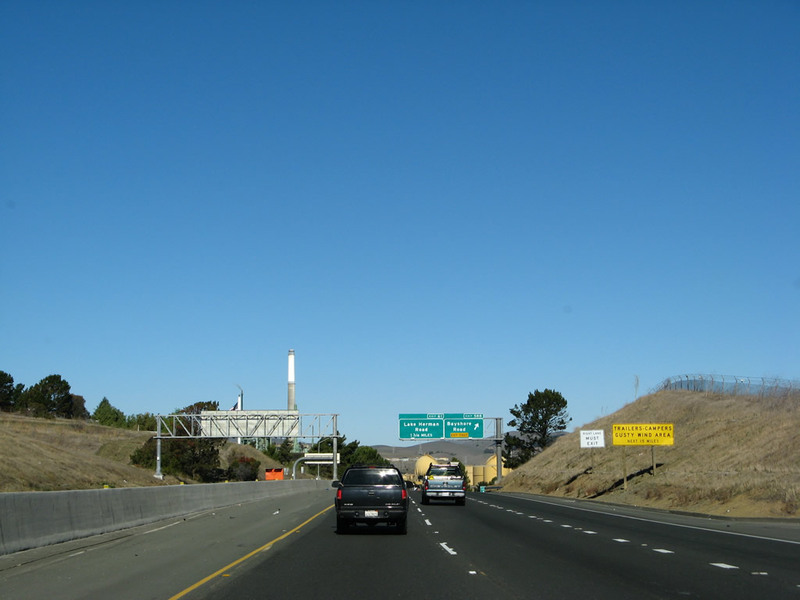 Interstate 780 begins its westbound journey toward Vallejo. Photo taken 11/23/07. 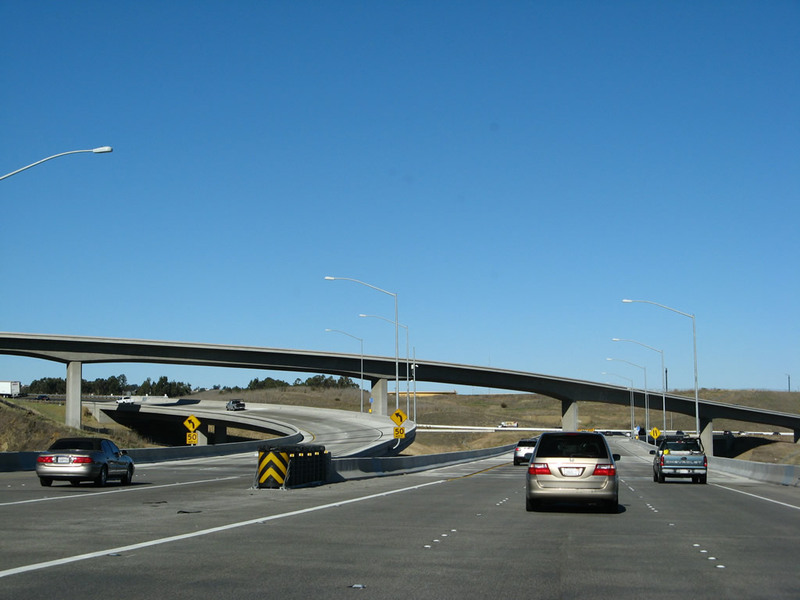 Returning to the Interstate 680 mainline, this view of the interchange between Interstate 680 and Interstate 780 is afforded on northbound Interstate 680 at the end of the Benicia-Martinez Bridge. Photo taken 11/23/07. 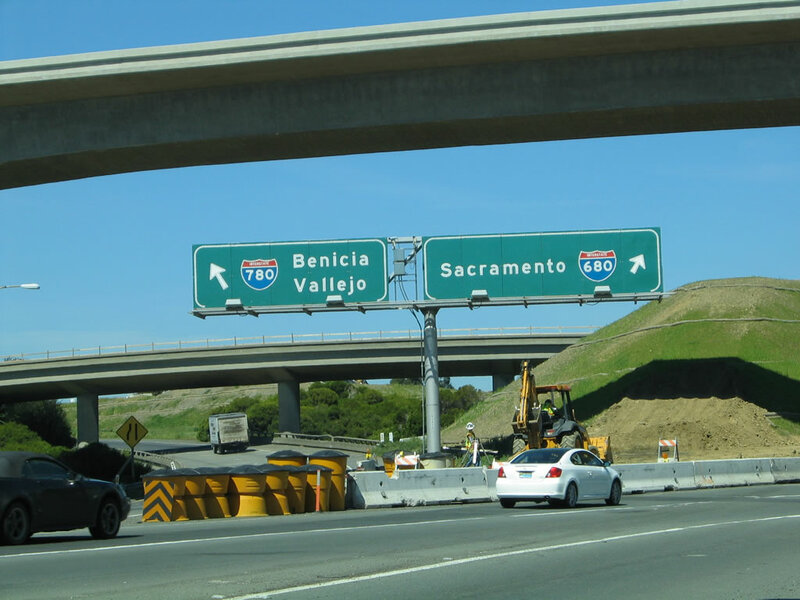 The right lane ends immediately after the Interstate 780 split, so only two lanes continue north along Interstate 680 toward Cordelia and Fairfield. 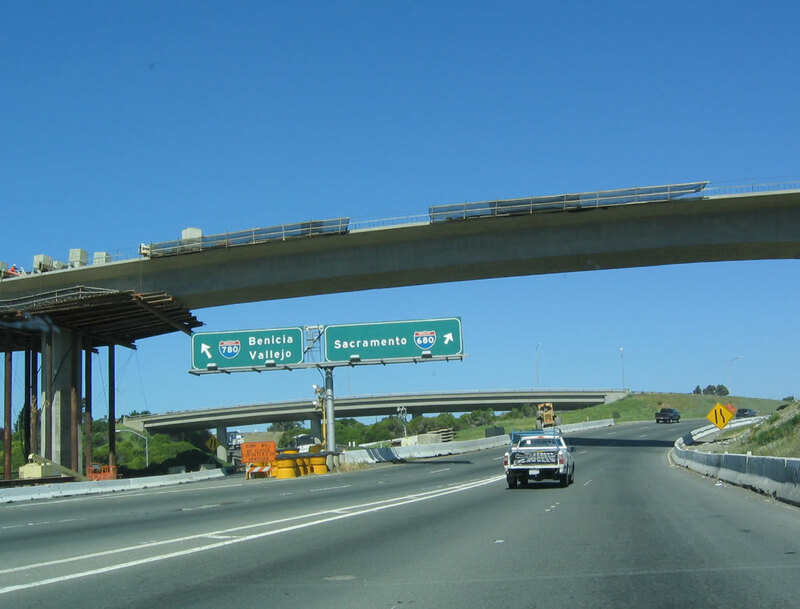 Ahead, the flyover ramp from Interstate 780 south prepares to merge onto Interstate 680 north. Photo taken 11/23/07. 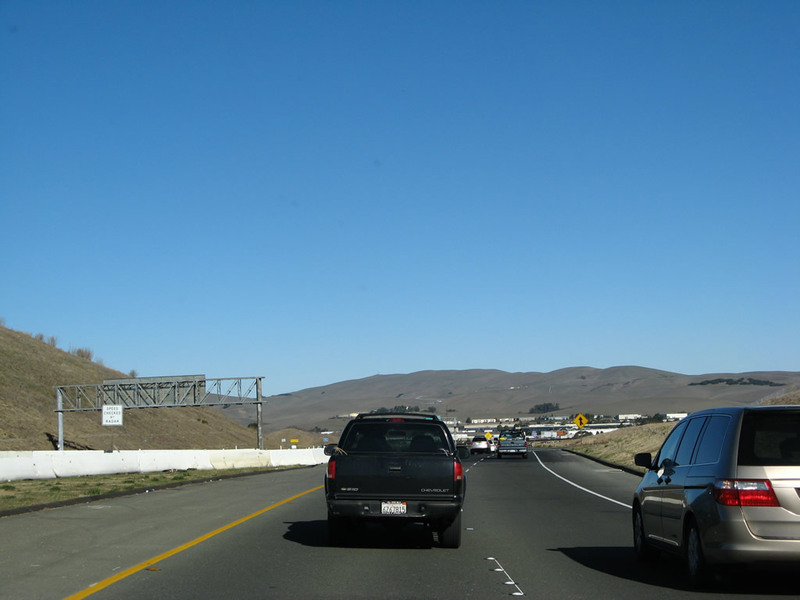 The new merge point with traffic from Interstate 780 is just ahead. 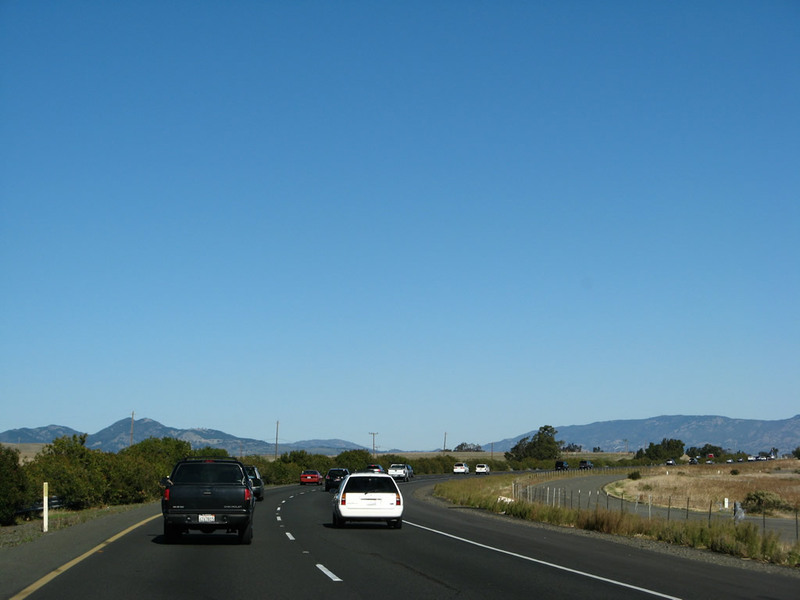 Previously, traffic from Interstate 780 merged onto northbound Interstate 680 from the left at this point. 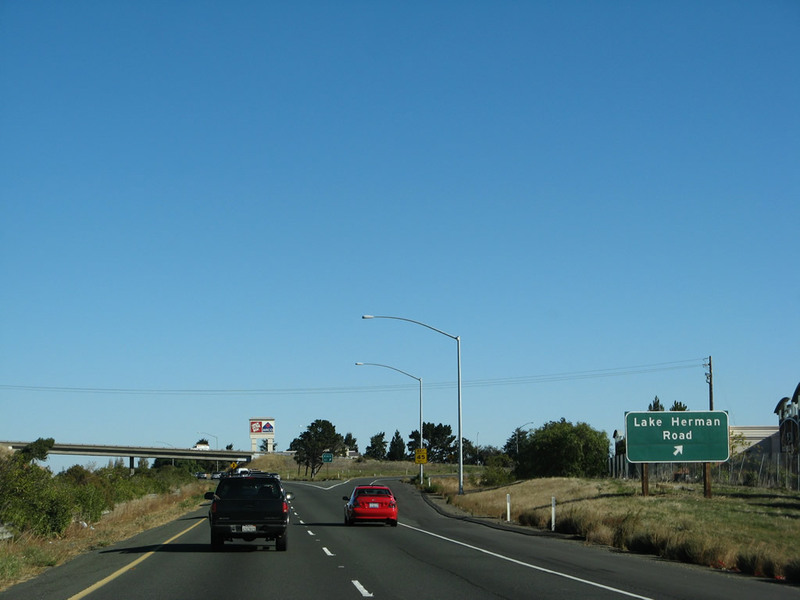 Between the Interstate 780 and Interstate 80 interchanges, Interstate 680 is designated as the Luther E. Gibson Freeway. Photo taken 11/23/07. 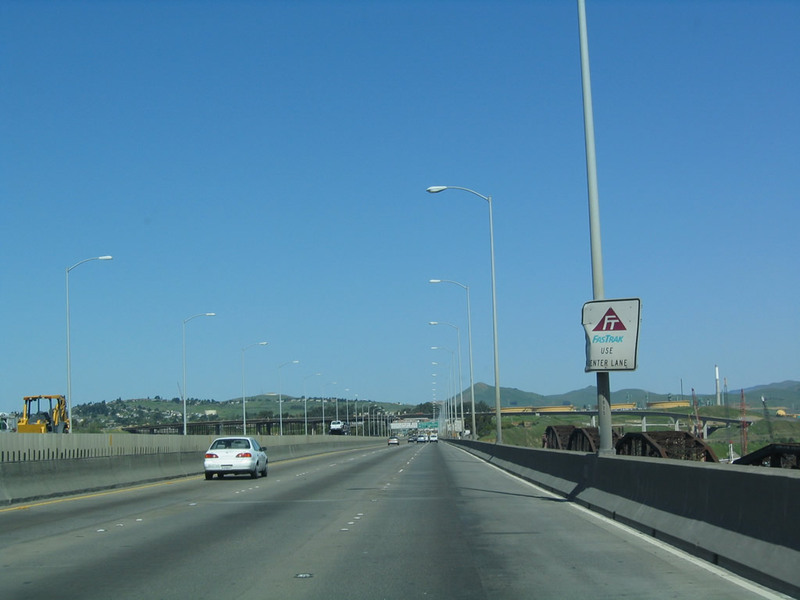 After the Interstate 780 ramp merges onto Interstate 680 north, this reassurance shield for Interstate 680 north is posted. Photo taken 11/23/07. 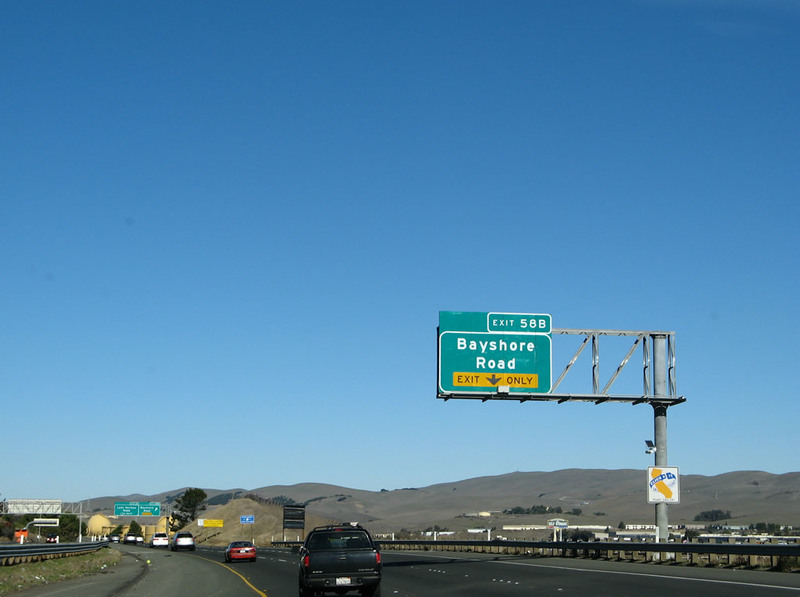 The next exit along northbound is Exit 58B, Bayshore Road. Note the temporary lane configuration as a result of construction of the approaches to the soon to be widened Benicia-Martinez Bridge. 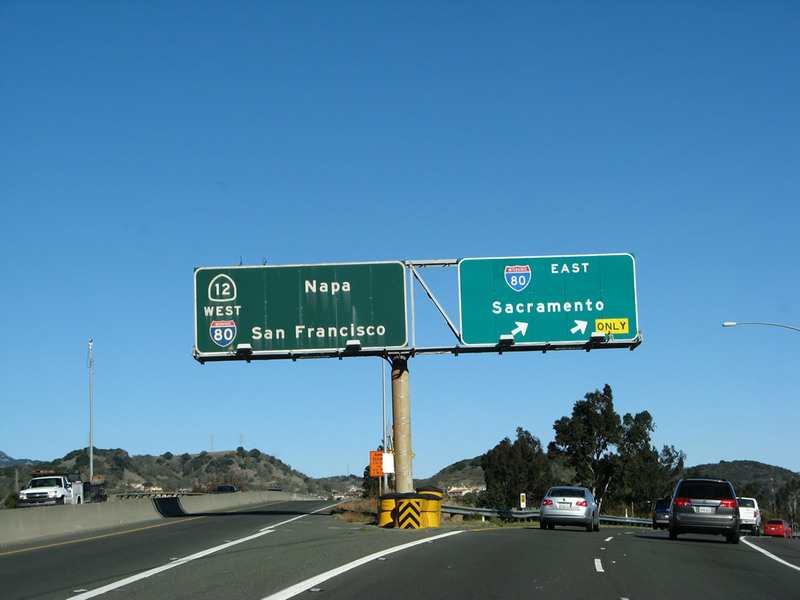 This sign has since been removed due to the installation of the Interstate 780 transition ramp. Photo taken 04/02/04. 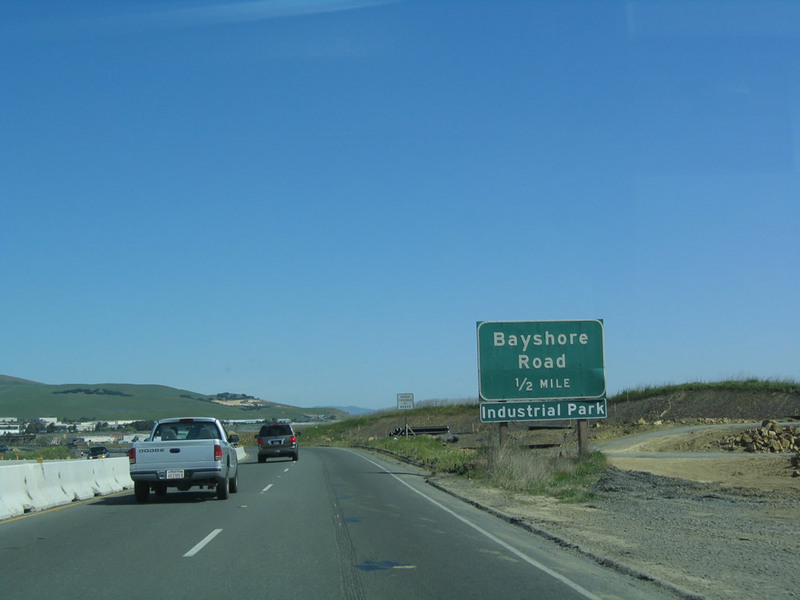 This guide sign was added in November 2003 and features the exit number for Exit 58B, Bayshore Road. Photo taken 11/23/07. 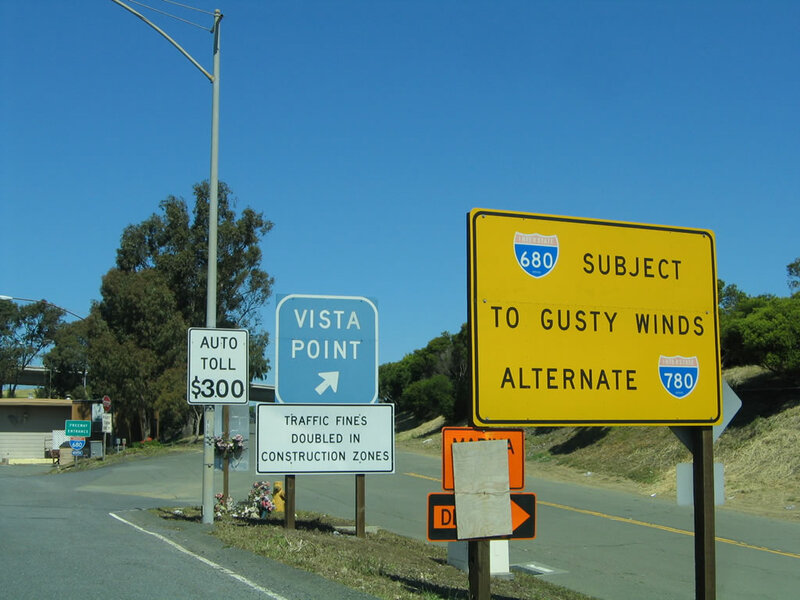 Gusty wind is common along Interstate 680 between Interstate 780 and Interstate 80. High profile vehicles, trucks, and cars with trailers should be mindful of changes to the wind conditions along this route. Photo taken 11/23/07. 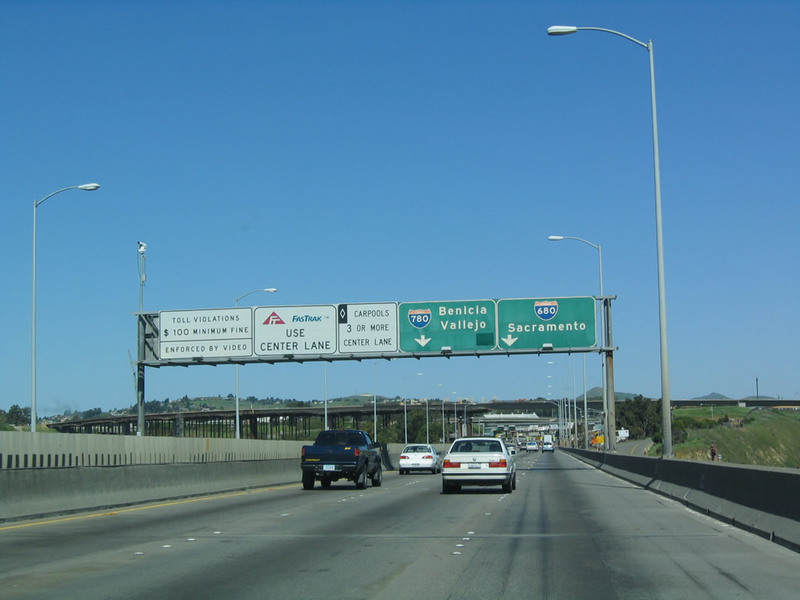 Northbound Interstate 680/Gibson Freeway reaches Exit 58B, Bayshore Road. At this exit is the massive Valero oil refinery (the smokestack is visible in the distance). 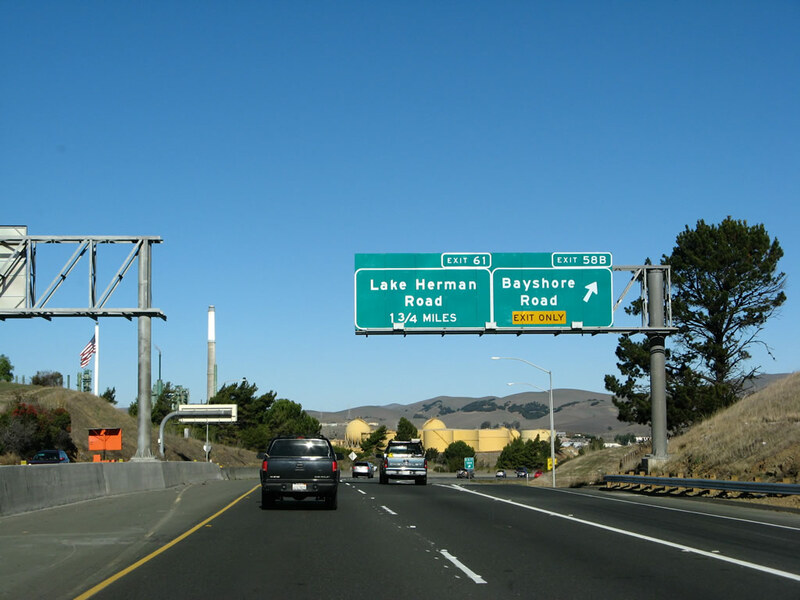 The next exit is Exit 61, Lake Herman Road. Photo taken 11/23/07. 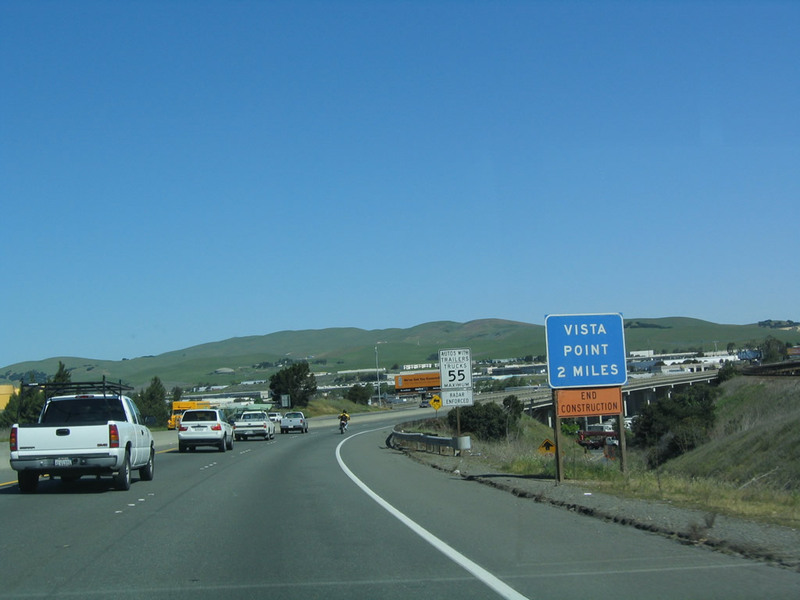 North of the Benicia-Martinez Bridge, Interstate 680 will connect to a vista point at Exit 62, but this vista point is located after the Lake Herman Road interchange (Exit 61). Photo taken 04/02/04. Immediately after the Bayshore Road interchange, Interstate 680 crosses a fairly narrow bridge with no shoulders and only two lanes of travel in each direction. A Union Pacific Railroad trestle is visible from the freeway on the east side of the freeway. Photo taken 11/23/07. 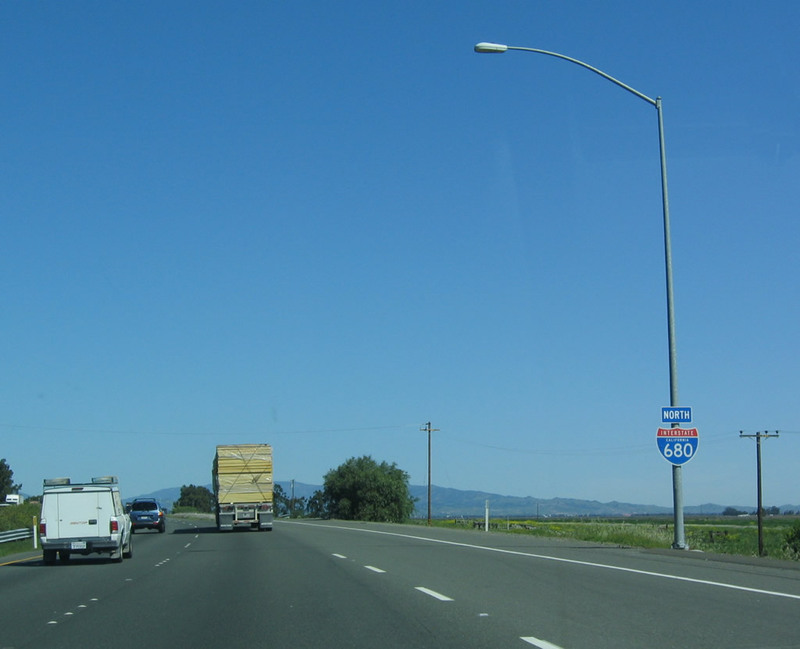 This mileage sign along northbound provides the distance to Cordelia, which is the northern terminus of Interstate 680 as well as the distance to the northbound control city of Sacramento via east Interstate 80. Photo taken 04/02/04. 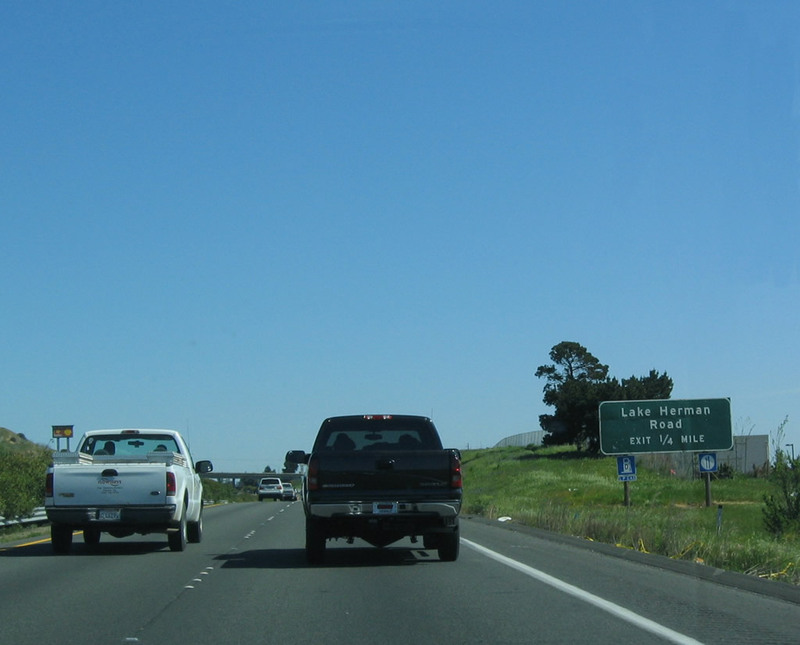 Lake Herman Road heads west from Interstate 680 into Benicia. 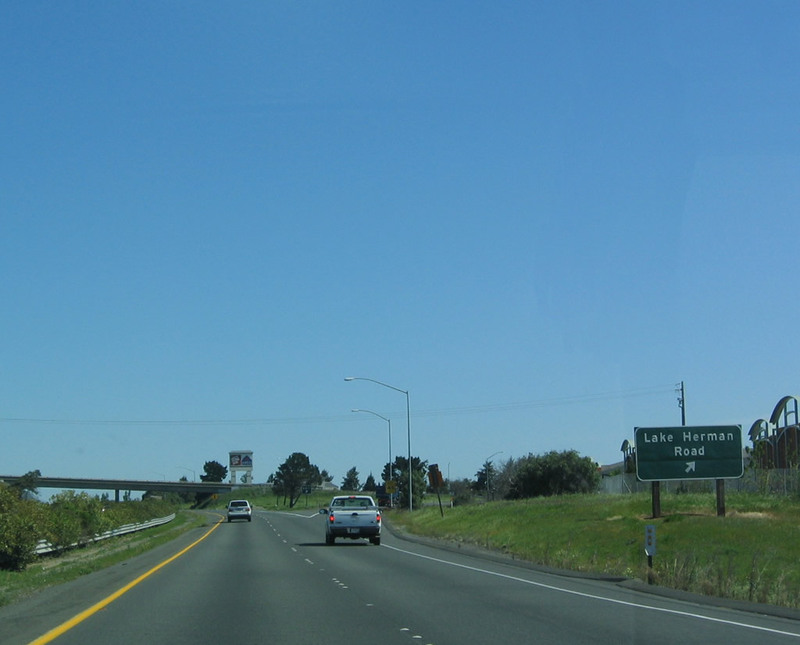 Paralleling Interstate 780, Lake Herman Road passes by Lake Herman in northern Benicia, then connects to Columbus Parkway in eastern Vallejo. Photos taken 11/23/07 and 04/02/04. 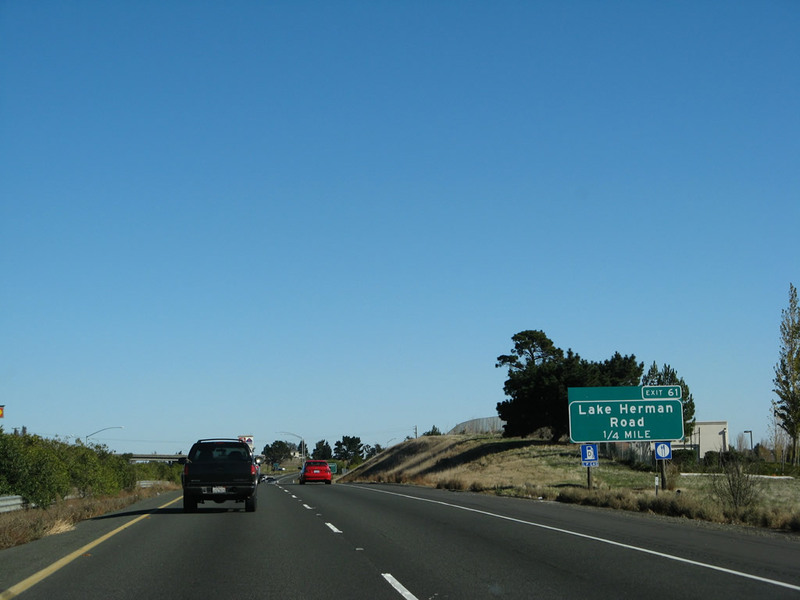 Northbound Interstate 680 reaches Exit 61, Lake Herman Road/Benicia. Photos taken 11/23/07 and 04/02/04. Taken in early spring, the hills and grasslands were green; they will remain that way into early May, but they will dry out to a golden hue by late summer. Photo taken 04/02/04. This view, taken in late fall, shows the same area with brown grass and the extensive wetlands that exist for miles to the east throughout the Delta Region. The Union Pacific Railroad tracks faithfully follows Interstate 680 (old California 21) north to Fairfield, and some railcars can be found on the tracks. Photo taken 04/02/04. This sub-standard advance guide sign for Exit 63, Parish Road, is one of a few that uses all capital letters. Photo taken 04/02/04. Northbound Interstate 680 reaches Exit 63, Parish Road. Photo taken 04/02/04. 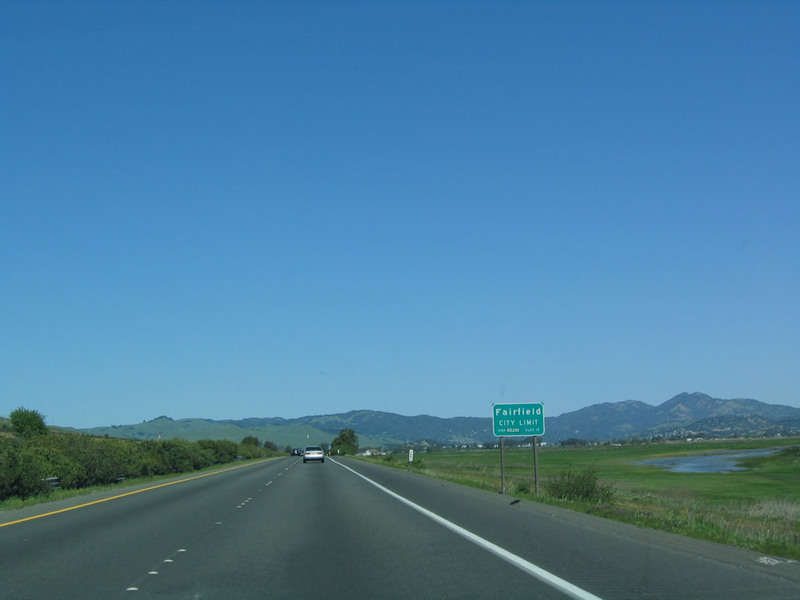 North of the Benicia-Martinez Bridge, Interstate 680 skirts marshes and wetlands, including the Goodyear Slough and Suisun Slough. Standing water is often visible on the undeveloped land east of Interstate 680, especially in winter. Photo taken 04/02/04. 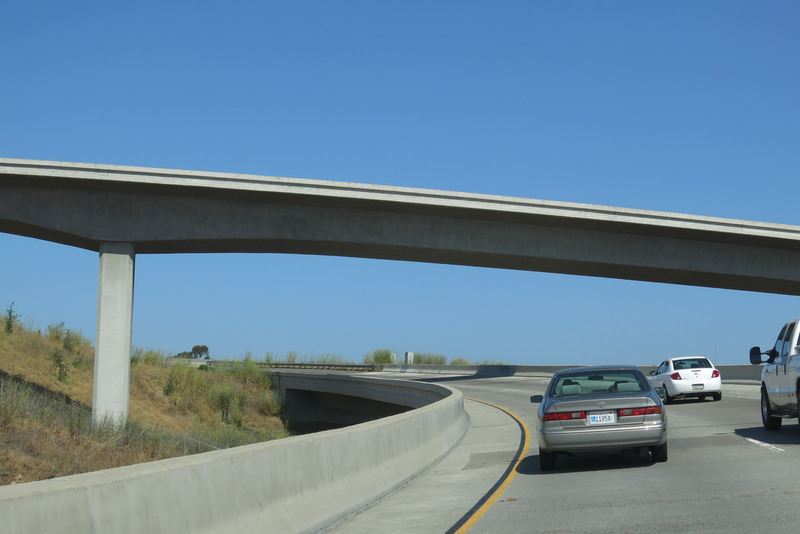 Staying on the edge of the delta wetlands, Interstate 680 has two frontage roads flanking it. This view shows Goodyear Road, which follows the freeway on the east side. Photo taken 11/23/07. The next exit along Interstate 680 north is Exit 65, Marshview Road. 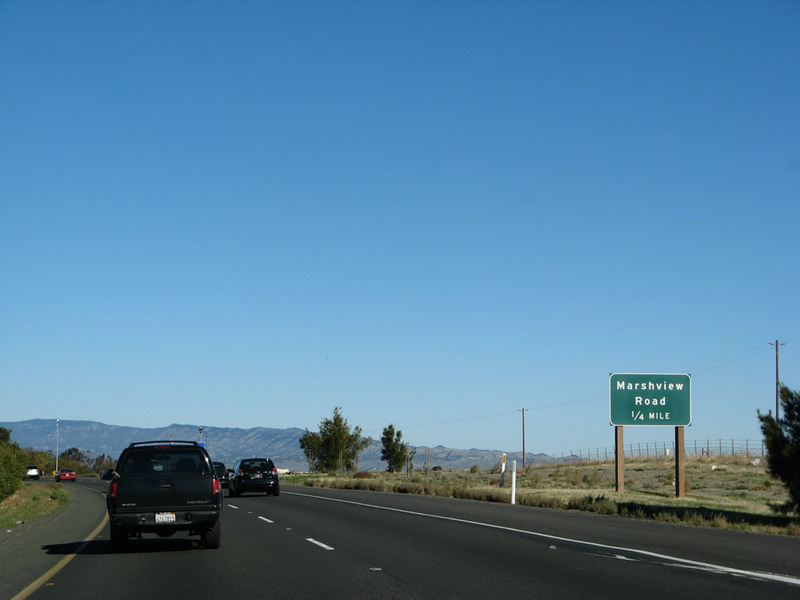 Aptly named, Marshview Road connects to old California 21 and the two frontage roads, one on each side of Interstate 680 (Lopes Road and Goodyear Road). Photo taken 11/23/07. Northbound Interstate 680 reaches Exit 65, Marshview Road. Photo taken 04/02/04. A Luther E. Gibson Freeway reassurance marker is located at the base of the Marshview Road overpass, obscured partially by some trees. Photo taken 03/31/05. 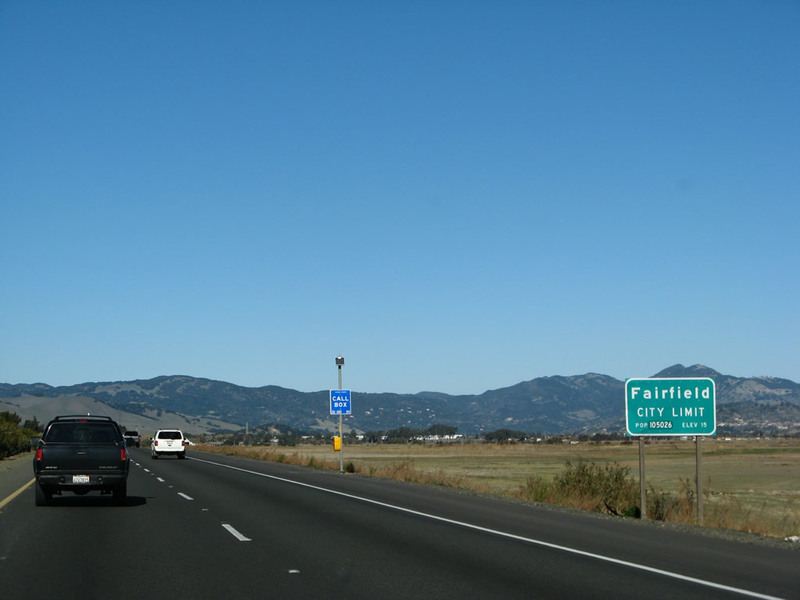 Interstate 680 briefly enters the city of Fairfield before it reaches its northern terminus. Photos taken 11/23/07 and 04/02/04. Due to persistent high winds in the delta, trees tend to grow in the direction the wind blows, resulting in some tree that bend to the east. Photo taken 04/02/04. 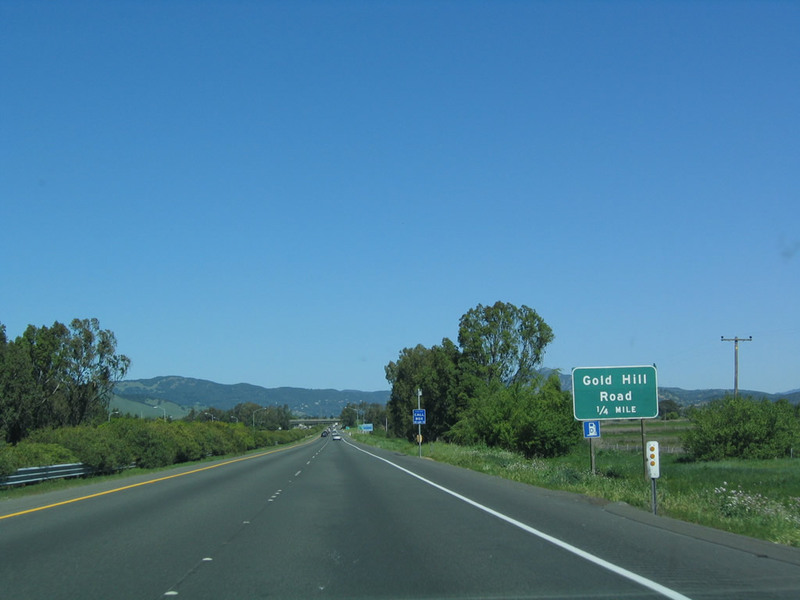 The next exit along northbound Interstate 680 is Exit 68, Gold Hill Road, 0.25 mile. Photo taken 04/02/04. 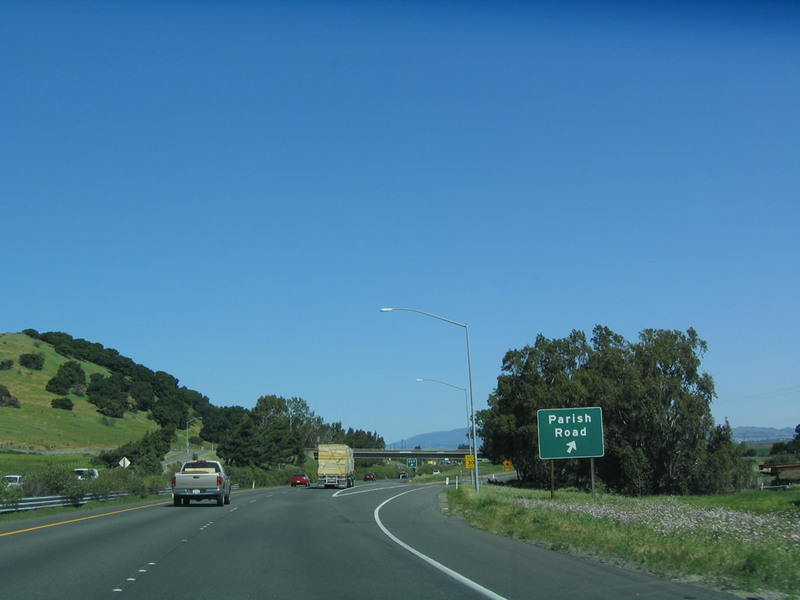 Northbound Interstate 680 reaches Exit 68, Gold Hill Road. Photo taken 04/02/04. This Interstate 680 north reassurance shield is the last one found on northbound. 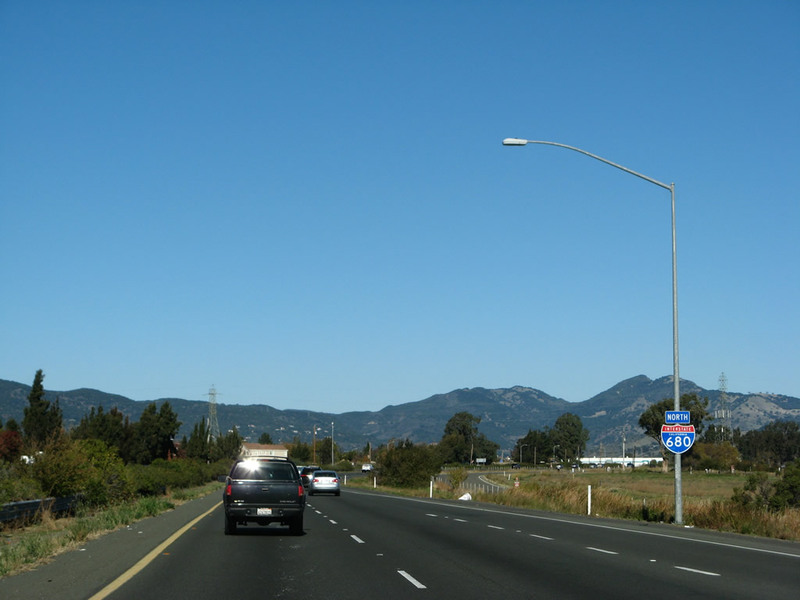 It is located immediately after the Gold Hill Road interchange (Exit 68) on-ramp. Photo taken 11/23/07. 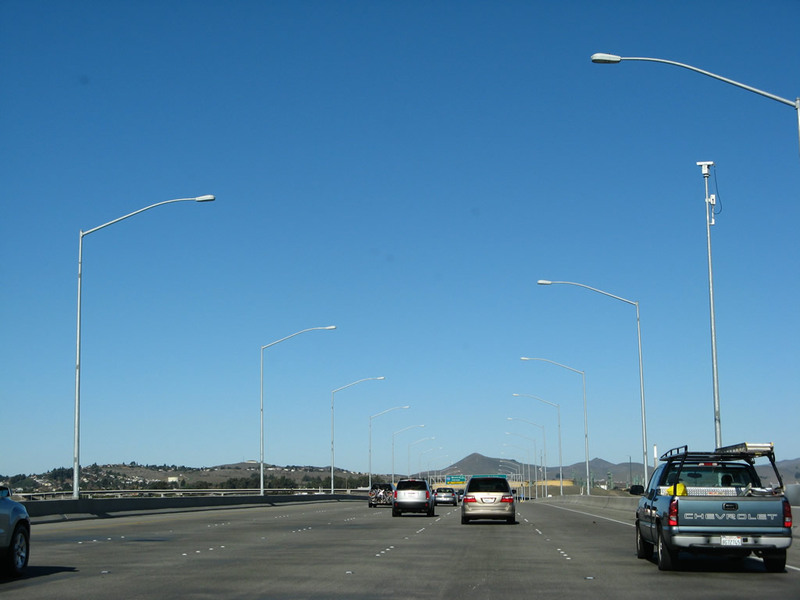 A Pacific Gas and Electric (PG&E) power line passes over Interstate 680. Cordelia lies just ahead. Photo taken 11/23/07. Green Valley Road (Exit 70) serves the community of Cordelia and accesses old U.S. 40 and an antique mall. Photos taken 11/23/07 and 04/02/04. 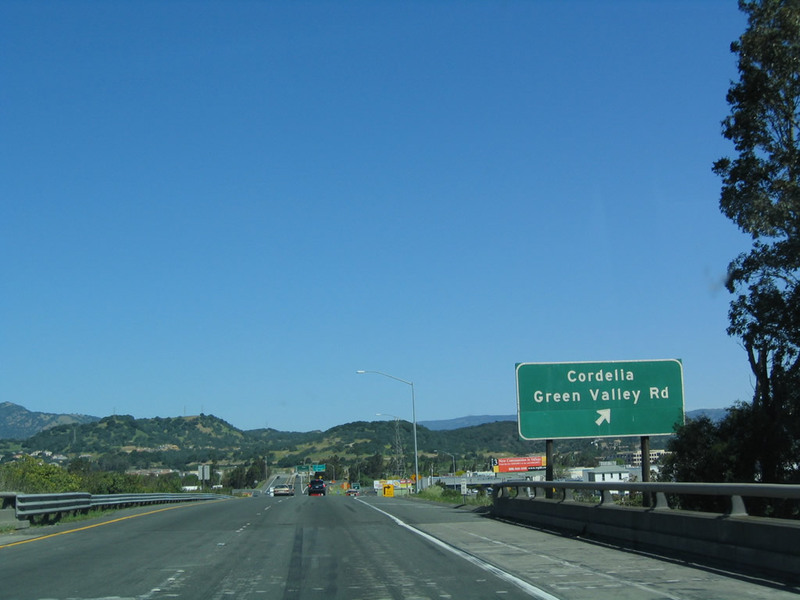 The final three exits along northbound Interstate 680 are Exit 70, Green Valley Road/Cordelia; Exit 71A, California 12/Interstate 80 West and Exit 71B, California 12/Interstate 80 East. Photos taken 11/23/07 and 04/02/04. 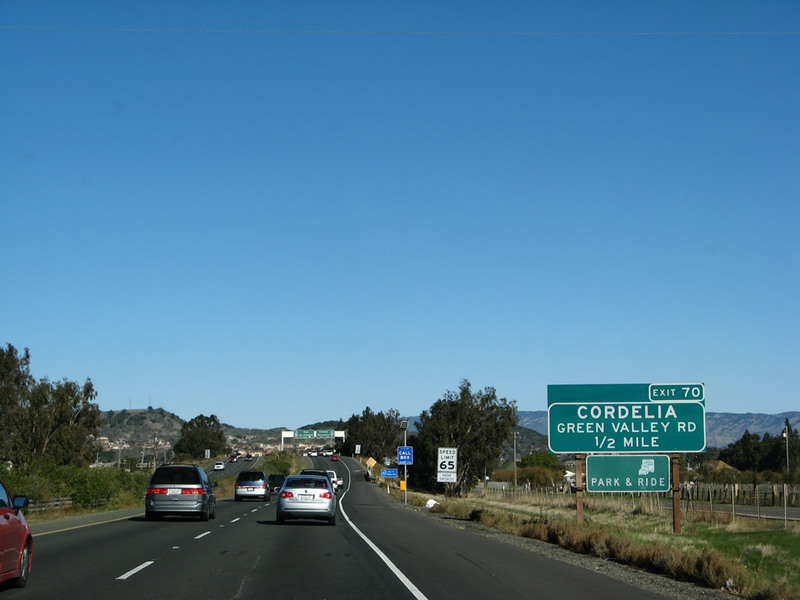 Northbound Interstate 680 reaches Exit 70, Green Valley Road to Cordelia and Historic U.S. 40. Photo taken 04/02/04. 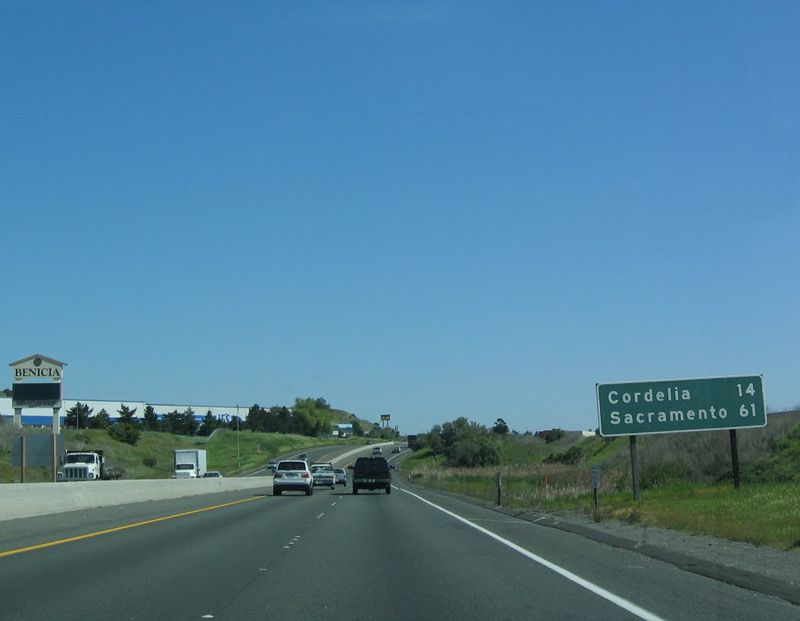 The rapidly growing Cordelia area comes into view as Interstate 680 passes Exit 70 and approaches its northern terminus with Interstate 80. 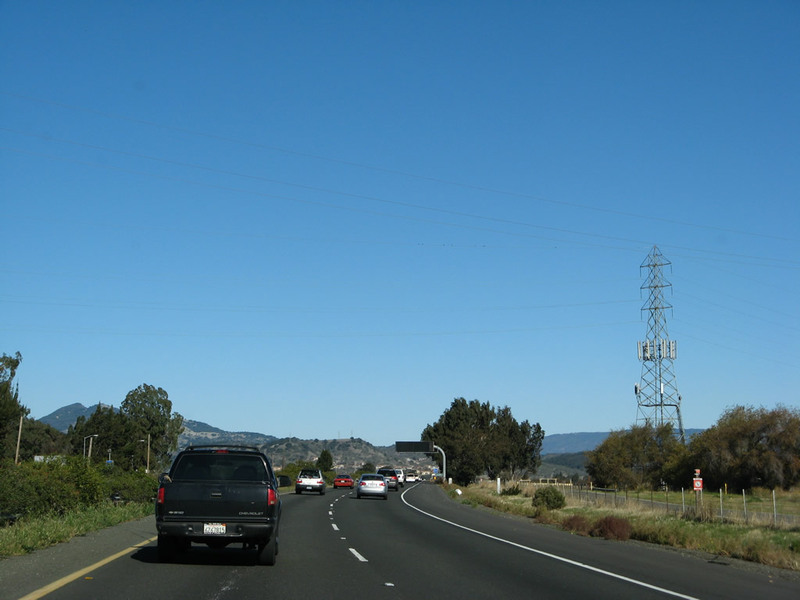 A Pacific Gas and Electric (PG&E) power line passes over Interstate 680 in the distance ahead. Photo taken 11/23/07. 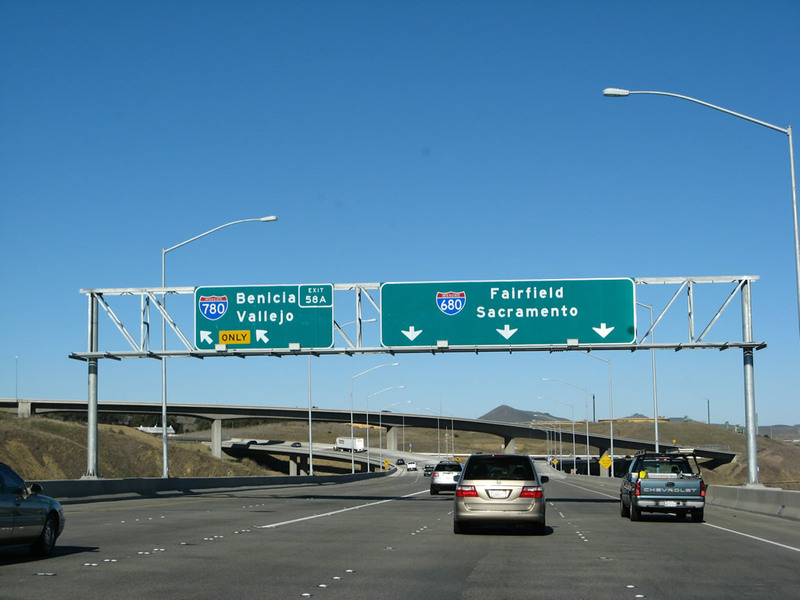 Immediately after the Cordelia exit, Interstate 680 north approaches Exits 71A-B, Interstate 80 and California 12. This interchange marks the northern terminus of Interstate 680; there is no end shield. Photo taken 04/02/04. 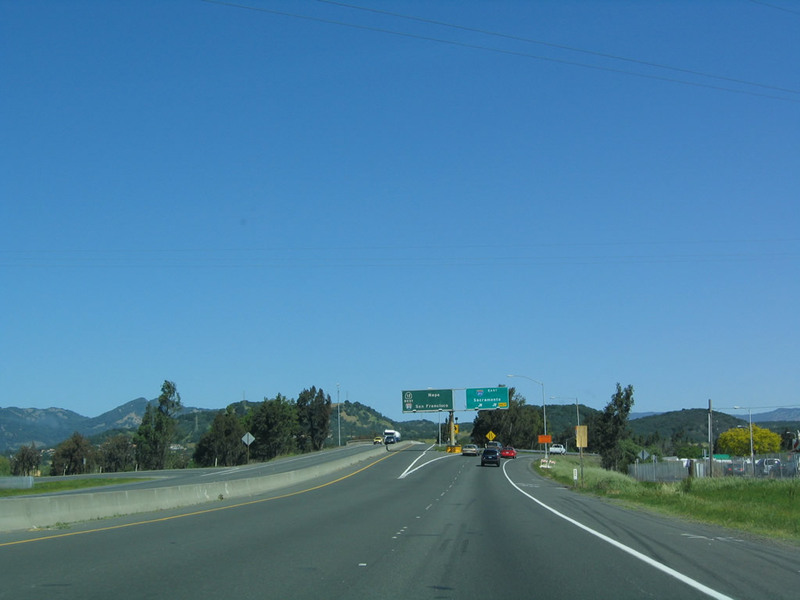 Northbound Interstate 680 ends at Exits 71A-B, Interstate 80 and California 12. 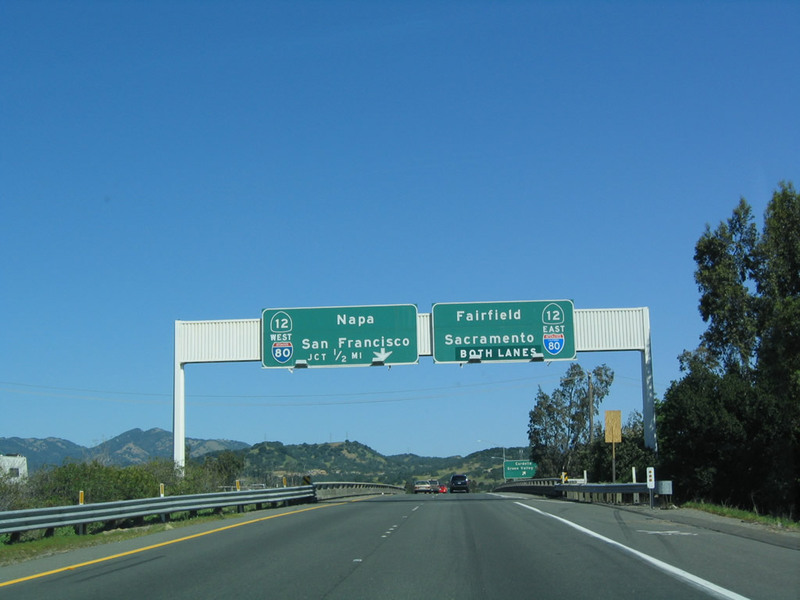 Use Interstate 80/California 12 east to Fairfield; the routes divide at Fairfield, with California 12 continuing east to Lodi, while Interstate 80 travels northeast to Sacramento. Meanwhile, Interstate 80/California 12 west remain merged briefly, and California 12 splits northwest toward Napa, Sonoma, and Santa Rosa. 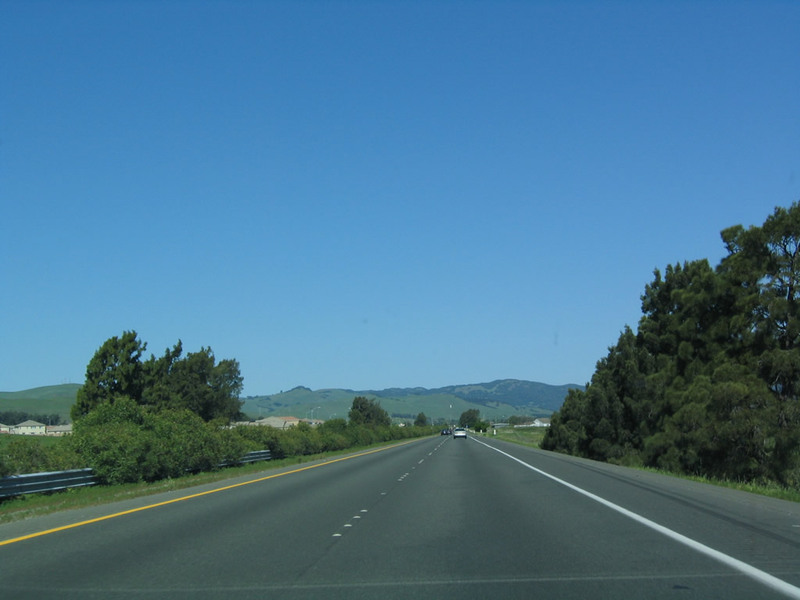 Interstate 80 turns southwest toward Vallejo, Berkeley, Oakland, and ultimately San Francisco. 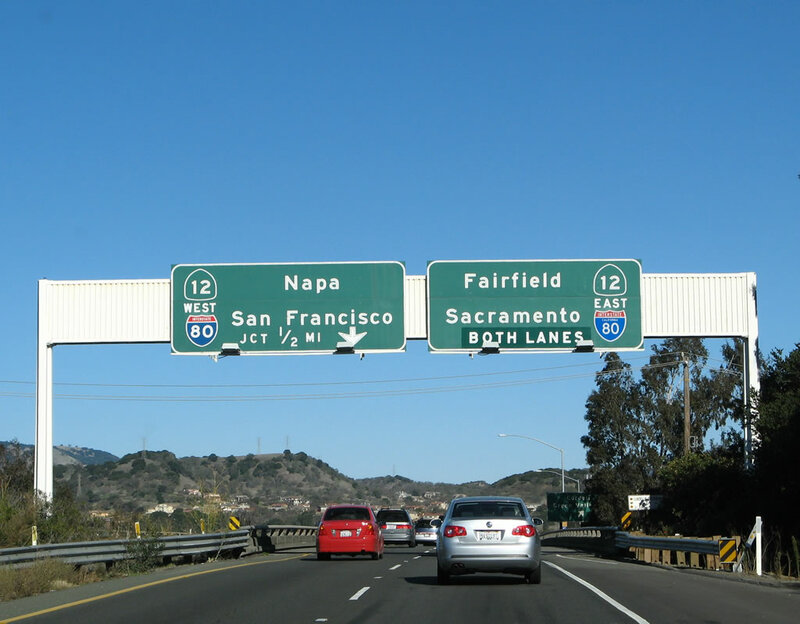 Note that the sign panel on the right erroneously omitted the California 12 eastbound shield. This is also an opportunity to compare an old porcelain-enamel sign with a new reflective sign. Photos taken 11/23/07 and 04/02/04. 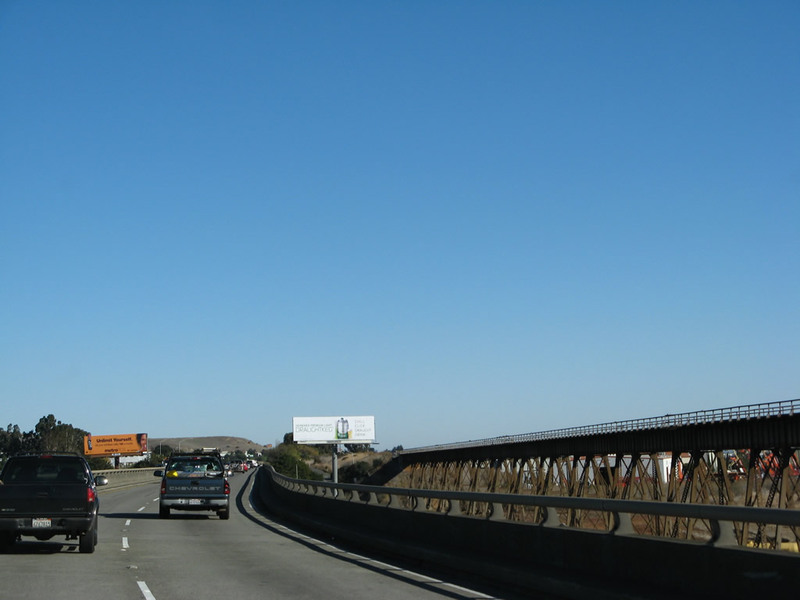 A railroad truss bridge is visible below the Benicia-Martinez Bridge. The new northbound span for Interstate 680 is being constructed to the east of the railroad bridge. Photo taken 04/02/04. 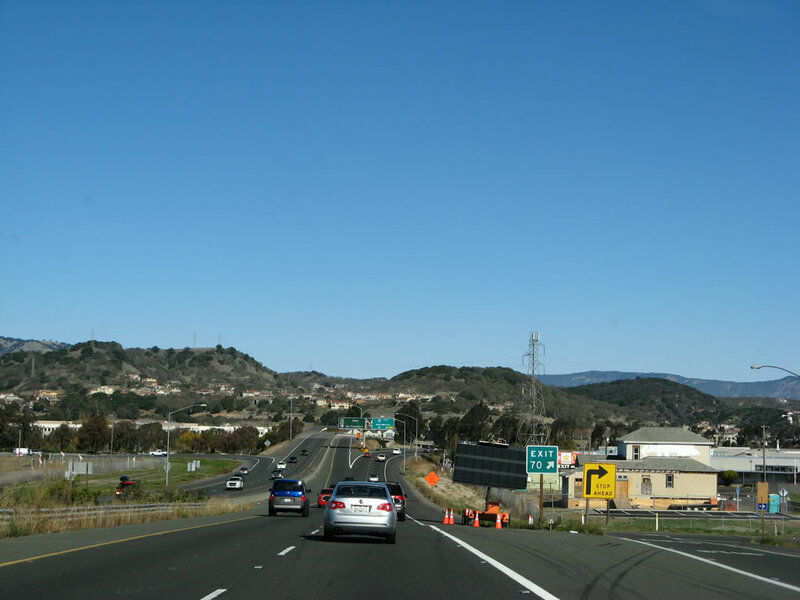 Northbound Interstate 680 (Benicia-Martinez Bridge) approaches Exit 58A, Interstate 780 west. 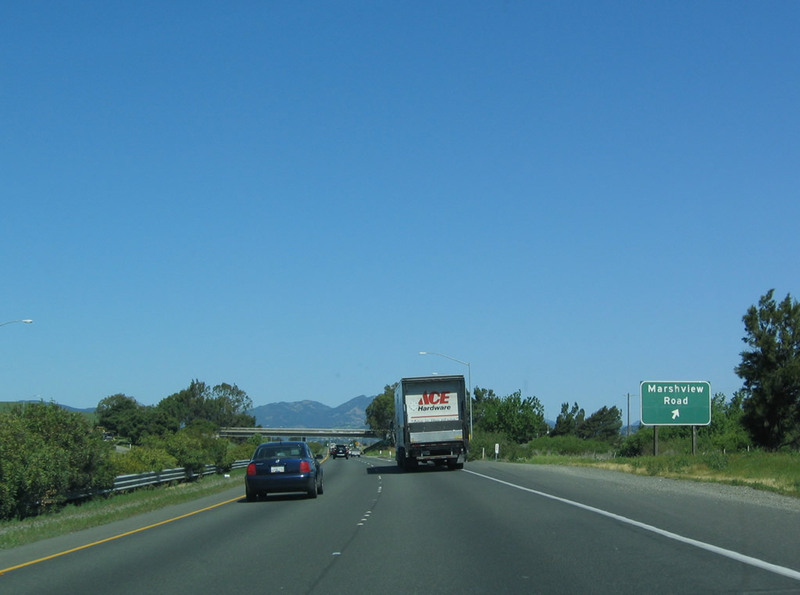 Interstate 780 leads west to Vallejo, which Interstate 680 continues north to join Interstate 80 near Cordelia en route to Fairfield, Vacaville, Davis, and Sacramento. The other signs on this sign bridge are restrictions related to the upcoming bridge toll. 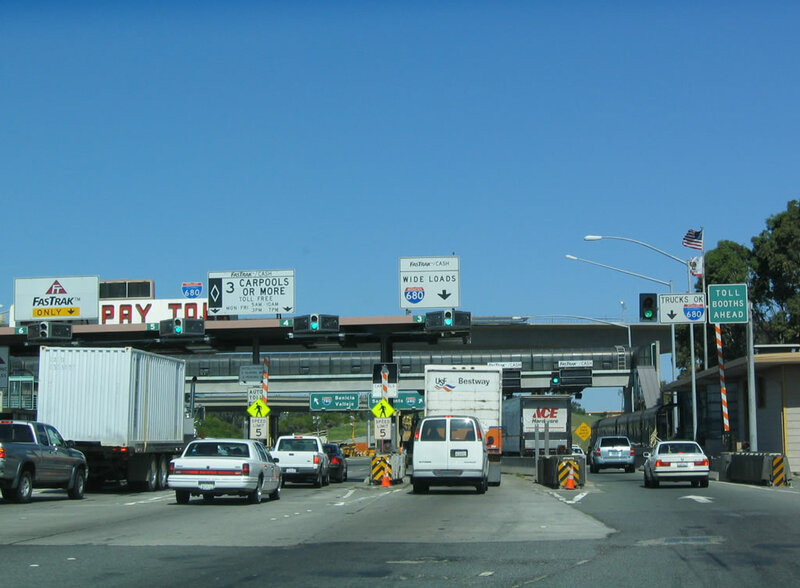 During rush hours, carpools with three or more occupants may cross for free, and there is a $100 penalty for not paying the toll. Photo taken 04/02/04. Another view of northbound as it approaches the toll plaza on the Benicia-Martinez Bridge. Note the odd "stop ahead" sign in use here. Photo taken 04/02/04. 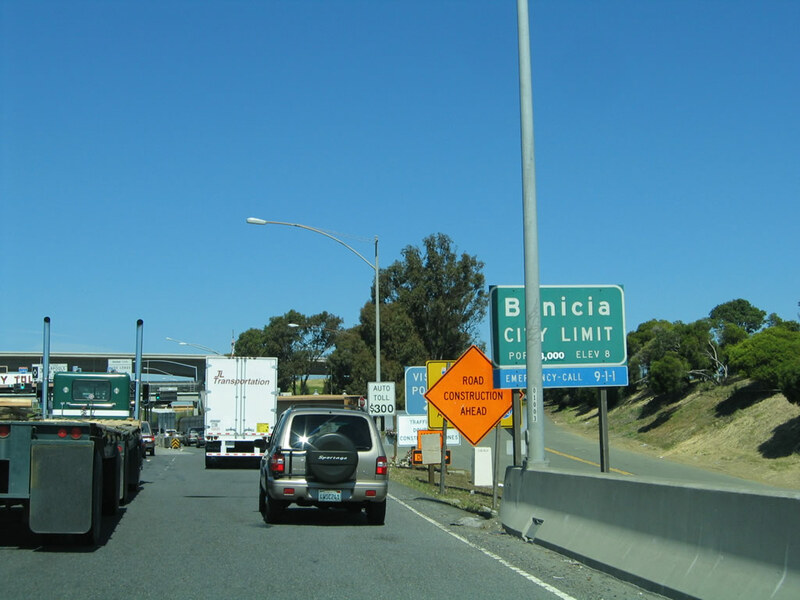 The Benicia city limits sign used to be located between the odd stop ahead sign and the toll plaza. A vista point is located here too (see next photo). Photo taken 03/31/05. 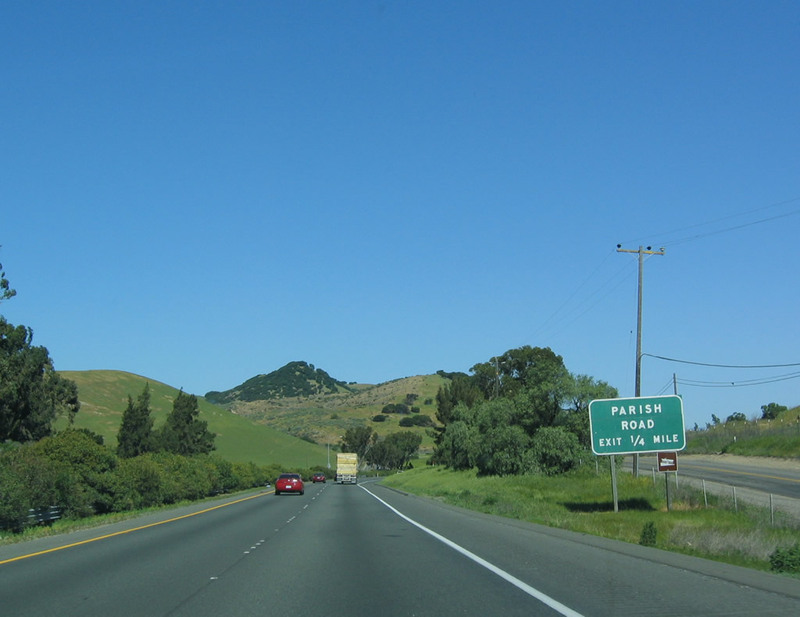 After the city limits sign, a warning sign about using Interstate 780 rather than Interstate 680 during periods of high windis posted. In addition, a little used and almost unnoticed exit to a vista point is located here. This exit is very difficult to get to due to its location near the old toll plaza. Note the freeway entrance in the background. This vista point is no longer functioning due to the opening of the new northbound span. Photo taken 03/31/05. 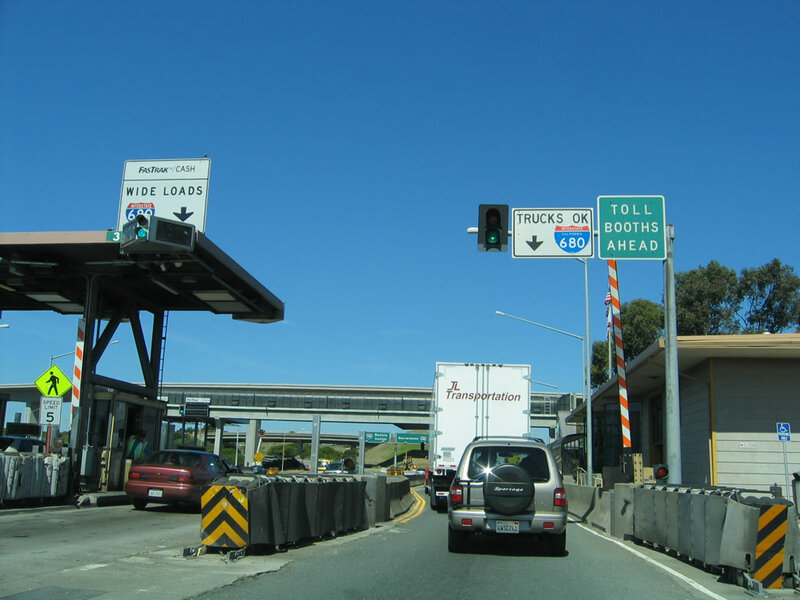 Another view of the toll plaza on the Benicia-Martinez Bridge is seen from the right lanes. Photo taken 04/02/04. Immediately thereafter is yet another view of the old toll plaza in the right lanes. Photo taken 03/31/05. 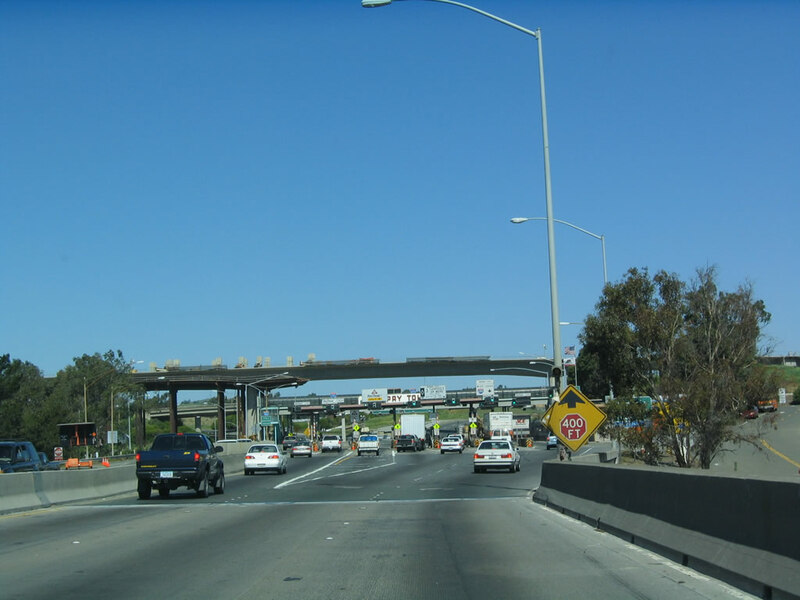 Interstate 680 north and Interstate 780 west used to split at Exit 58A immediately after the toll plaza. 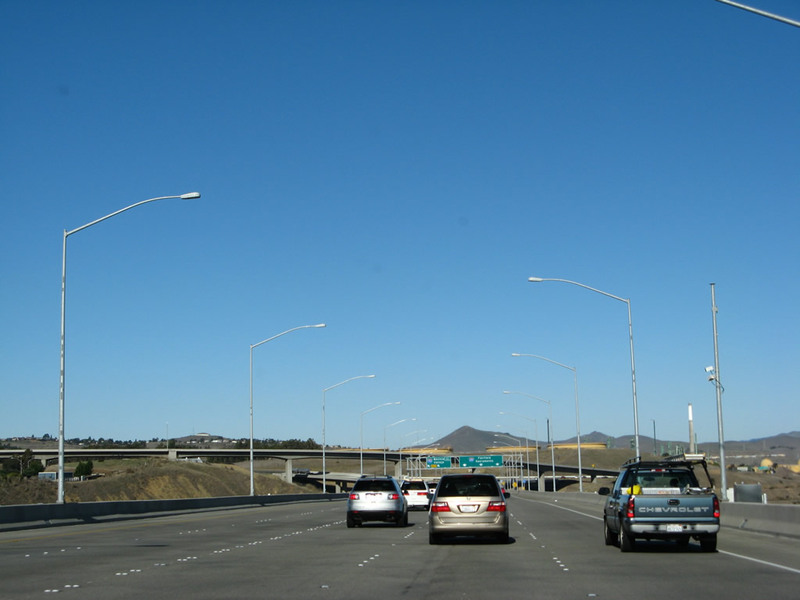 The first photo shows the overhead sign as seen from the through traffic lanes, which the second photo was taken from the left lanes en route to westbound Interstate 780. 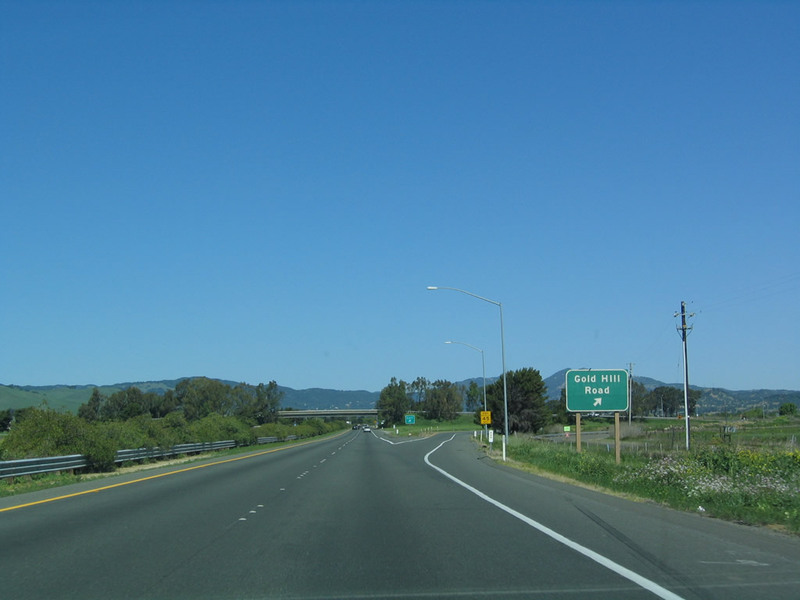 This interchange marks the eastern terminus of Interstate 780. Photos taken 04/02/04 and 03/31/05. 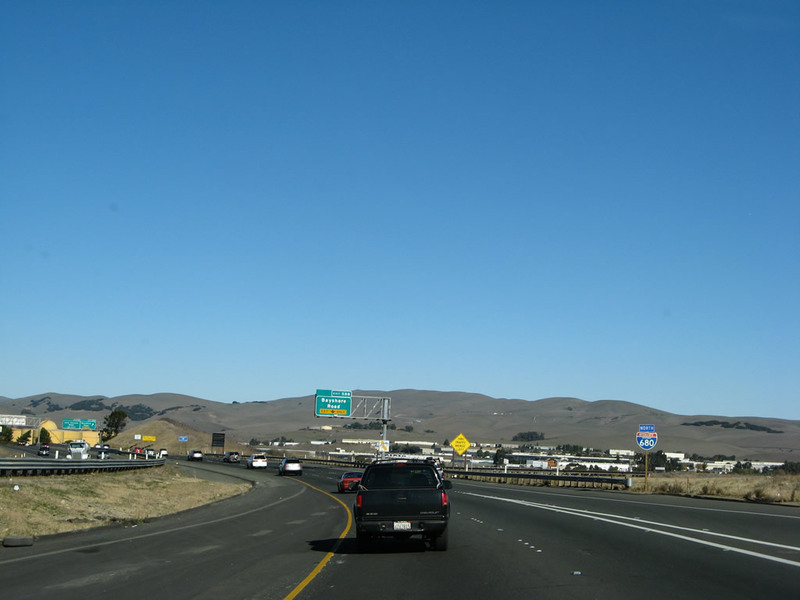 This view of Interstate 680 north is seen as the freeway departs the vicinity of the bridge and Interstate 780 interchange. Photo taken 04/02/04. Page Updated August 29, 2013.